One of the most talked about movies of this year is Barry Jenkins’ Moonlight. It has taken me way too long to see this movie, but I’ve finally made my way to the theater to go see it, and I was completely blown away. I had such high hopes for this movie because the praise from both audiences and critics has been unanimous. Having the high hopes that I did can sometimes be dangerous because it’s rare that a movie so perfectly matches your expectations. I’m happy to say that Moonlight, with its solid performances, story, and cinematography, stands with some of the best movies of this year. The story of Moonlight is broken up into three separate acts. In the first act, we meet a young Chiron (Alex Hibbert), a shy boy who is constantly being chased and bullied by his classmates. He can’t even find help at home since his mom’s (Naomie Harris) problems with drug addiction and prostitution often forces him out of the house and back on the street. His only solace is in a local drug dealer named Juan (Mahershala Ali) and his girlfriend, Teresa (Janelle Monáe), who let him stay over and give some of his first life lessons. In the second act, Chiron (Ashton Sanders) is in high school and is still being harassed. He knows something is different about him and finds a new kind of comfort in a classmate named Kevin (Jharrel Jerome). This comfort is soon destroyed and Chiron, himself, becomes pushed too far. In the final act, Chiron (Trevante Rhodes), now going by Black, is an adult drug dealer living in Georgia. He gets a call from Kevin (André Holland) one night in Florida and the two meet up in the restaurant that Kevin works in. This meet up once again rekindles something in Chiron which forces him to come closer to his insecurities and his true self than he may ever have before. Right from the very first shot of Moonlight I was hooked. The film opens with a fantastic long take that circles a group of characters having a mundane conversation that’s made interesting by this stylistic choice. The whole movie is a visual and auditory masterpiece that uses these techniques to help tell the story instead of completely washing the story out with style. Barry Jenkins and cinematographer James Laxton find very unique places to put the camera or move the camera to get an image that is evocative and sometimes unexpected. This is easily one of the best looking movies of the entire year. The sound also helps better the story and sometimes isolate you into the mind of Chiron. There are moments when people are yelling and screaming but there’s this strange silence that fills the screen that is far more dramatic than anything that’s being said. There’s a few instances where the sound becomes more of a staccato which creates the tension necessary for a scene. This combination of sight and sound really gives this movie a special artistic touch, and I couldn’t imagine the story being told by someone else. Like I said, the style of this movie doesn’t overshadow the story, and that’s mainly because the story is so well told and so beautifully realized. Without giving anything away, the story of this movie takes a very real and relevant situation someone can be going through and puts this situation in a really harsh and unforgiving environment where only a few people around you really understand and care about you and what you’re going through. This can often times be a tough movie to sit through because it can be very unforgiving with what happens to some of the characters. By the end, however, I felt like the characters have all changed, matured, and learned. The only way this movie could be told is in the three part structure that it’s set up as. If the film only focused on one of these time periods, then Chiron’s character wouldn’t learn and change like he does in the finished product. This is a very real and down to earth film that doesn’t pull any punches but still leaves the audience feeling satisfied. Like so many great movies, none of this would have the impact that it does if the performances weren’t as strong as everything else. This is also one of the best acted films of the year, right along with Manchester by the Sea. Mahershala Ali gives his best performance in Moonlight, and I really want to see more of this actor in feature films and not just television. The real stand outs for me, however, are all three actors that play Chiron. Trevante Rhodes and Ashton Sanders who play the adult and teenage Chiron, respectively, share very similar quirks and characterizations that really makes the audience feel like they’re watching the same person at different ages. Of course the different angsts and motivations of their ages come out as well. I especially want to talk about Alex Hibbert who plays the young Chiron. It’s rare that an actor of his age can make me believe so easily that I’m seeing a real person and not just a character onscreen, and he pulls it off with ease. It’s a great performance. The rest of the supporting cast featuring Naomie Harris, Janelle Monét, and André Holland are all perfectly casted and performed as well. 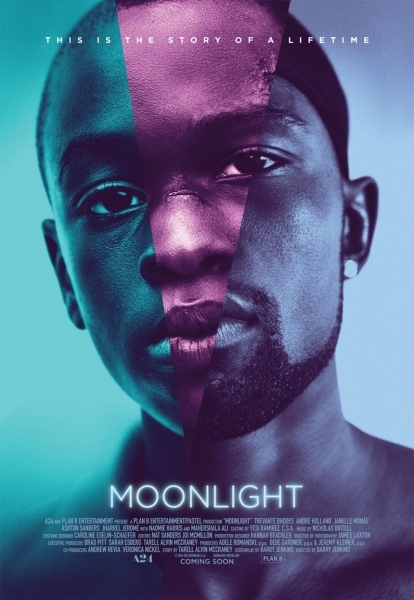 There’s been a lot of great and memorable movies to come out in 2016, and Moonlight is up there with the best of them. This is a very dramatic movie that never falls into the pit of melodrama while also exploring themes that may seem familiar, but never actually makes itself a cliché. It’s written and performed in such a way that feels very down to earth and organic. It’s also filmed in such a way that is very artistic and stylistic without ever going overboard. I highly recommend this movie for so many different reasons.